Stephanie turned the BIG three – oh. We celebrated with cake and watermelon coolers. There was beer, but I needed a special drink for a true girly girl. This fit the bill. John & I kind of snarfed on them the night before sans alcohol. Let me tell you – a 12-15 pound watermelon will make about a gallon of coolers AND they taste even better the next day. Simmer for 5-10 minutes. Strain and set aside. 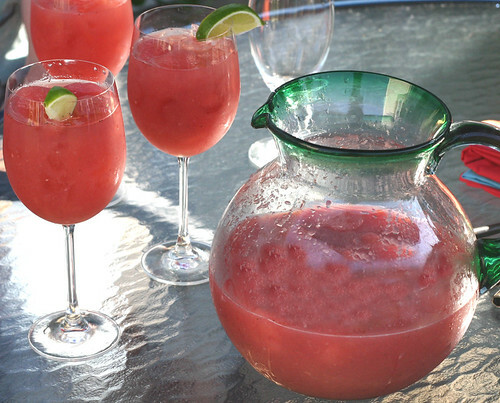 Peel, seed and puree, in a blender, a very ripe watermelon – 2 quarts worth. 1 Cup Lime Juice – fresh or bottled we noticed no difference. Stir well. Store in fridge and serve cold over ice with a lime garnish. Vodka is nice in these too. OK these look delicous and perfect for our hot summer nights!! Can’t wait to try them. Thanks for the recipe, I was looking for a watermelon drink recipe! Oh, this is great! I just made a strawberry lemonade that we loved and this is going to make everyone happy too. Thank you for sharing your recipe. That looks very refreshing! 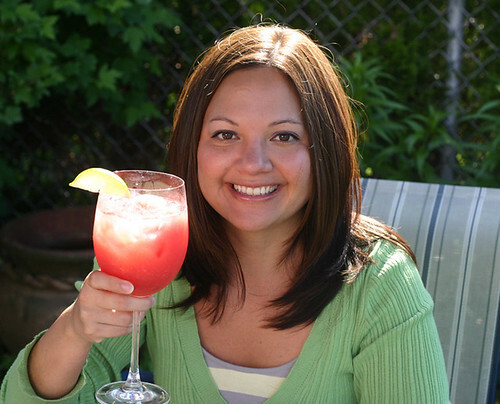 Try sangria for your next summer drink! Just made this today and I’m in love. It’s so wonderfully refreshing! I’ve linked back to your recipe in my post. Thanks for sharing this. Oh NO – Thank YOU! For stopping in and reporting back! It stores very well in the freezer too! Wow, this sounds really good. I was just thinking of the next type of popsicle to make for my daughter. I will make these and let he try them out. Thanks for the idea.